It is always nice to see that companies put effort in their packaging. Mostly this is the first indicator of the product’s quality. Bang & Olufsen has done a great job in this area. The white box is stylish, it is made from quality materials and if you pick it up, you feel the solidness. Important information is on the box, which makes it easier to choose for this product when you are in a store. The package includes the speaker, a power supply and a starting guide. The speaker is wrapped in some plastic and protected by some Styrofoam. After unpacking the speaker the first thing I noticed was the weight of this speaker. The speaker itself is not that big ( W: 11,2 x H: 15.1 x D: 14 cm ). So you can relate its weight to the quality materials that they use, like aluminum and polymer. On the back there are 2 buttons, but the power supply input was actually hard to find. Luckily they included this starter guide, which pointed out that you can open half the bottom to insert the cable. Despite the fact that it was hard to find, it is a really clever solution. No more keeping space between the wall and your speakers for some power supply. 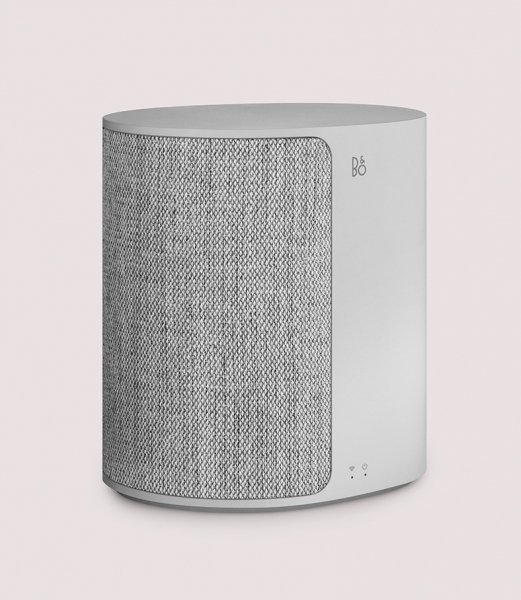 Bang & Olufsen is well known for their simple, tight, modern and stylish designs. With the M3 they have proven themselves that they can do this over and over again with new ideas, without getting boring. This is a great quality! You can easily take of the top, and change it with another cover. So you can buy another cover that fits your preferences even more. Just take off the previous one and plug in the new one. When I first downloaded the application that was written on the sticker on the speaker, I couldn’t connect. After some minutes I realized that there was also another application. I think this was just badly indicated. But it looked like in the near future, this first application I installed would support the M3 as well. Of course if you want to connect with Bluetooth or just use a jack you don’t need this application. To make connection, it is clearly indicated how to in the quick starting guide. These options are really necessary, but if you are just going to use some Bluetooth or a jack with 1 speaker, the M3 is a bit overkill. The casting is really easy, once the application is installed you can easily cast your Spotify or Google-play or something else to this device. What they have done with the settings is also amazing. First you can adapt your sound to where you place it in your house in a corner or against a wall or maybe just in a free space. Despite this great feature you also have a Tonetouch like they call it, so you can change the EQ to your own preferences. I have to say these controls are remarkable easy and are designed with eye for performance. You can even add an alarm in the app, so you can be woken up by this amazing piece of hardware. The one big thing I miss in handling this device is voice control. When implemented, this would get the speaker to a whole new level. Bang & Olufsen is a company that stands for high quality products. Their audio products never disappoint in producing some quality music. Inside this rather compact speaker, you’ll find a 9.525 cm woofer and a 1.905 cm tweeter that produce these incredible soundscapes. They both are 40W class D power amplifiers. Despite its compactness, it can go really loud. It is possible to go to a level that nobody will probably ever use in their own home, certainly not in smaller rooms. Nevertheless you can go as loud as possible without having a distorted sound or get clipping. When turning up the volume, it will introduce a bit of noise, but this is normal if you raise the volume this high. Bang & Olufsen ensures you that the M3 will fill up every room with warm tones. I have to say, this is certainly true. Their sound is really warm, you could compare it with a tube amplifier, where the vacuum tubes are used as preamplifier to deliver warmer sound. Because of the Tonetouch feature, you have a great variety of EQ’s. They succeeded in making the handling of an equalizer easier and even more efficient. In normal settings I think they have a bit too much Bass when used on a low volume, but that is a personal taste and like said before it is easily adjustable. Nevertheless if you are someone who uses equalizers quite a bit, it is always nice to have a real equalizer as an option. The only downside you have is that if you connect other speakers with each other for the multi-room experience, you can’t use a stereo setup. Too bad I couldn’t try out to setup several speakers and link them with each other. While it is the cheapest multi-room speaker they offer, it’s still pricy in comparison to other brands. But if you want quality speakers, you need to pay for it. If you compare it with the M5, Bang & Olufsen has achieved their goal in making a smaller, cheaper version of it. It is not because it is the cheaper version of the M5 that they didn’t deliver quality service. This speaker performs like it is supposed to. The application makes it easy to control for young and old. If you are looking for a multi-room speaker that can easily be controlled, with a warm sound and an awesome design. I’d recommend this speaker to you. Therefor I would love to give the Bang & Olufsen M3 the golden Blackholetec award.